This week, students will practice spelling and using sight words, number related words, and academic vocabulary. In week 6 of the 5th grade spelling program, you will find the following words: January, England, design, bruise, awkward, picnic, bicycle, triple, trilogy, trinity, duplicate, quadruple, unicycle, duplex, uniform, quartet, quadrant, octave, rhythm, and cadence. To continue working on the spelling words for this week, students will be asked to complete five corresponding, printable activities. 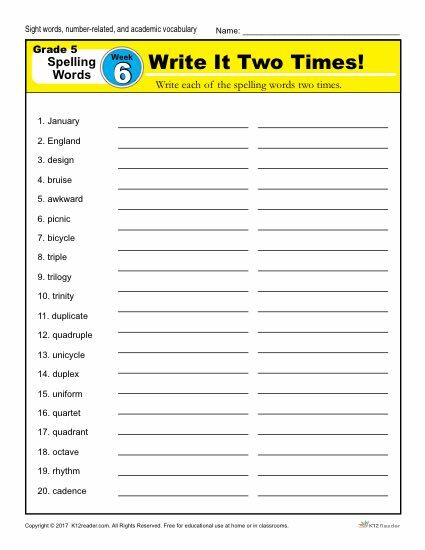 These worksheets include: Write it Two Times, Dictation Sentences, Circle the Correct Spelling, Write a Sentence Part 1 and Write a Sentence Part 2. Each of the activities are easy to download and print for use at home or in the classroom. The spelling words master list for the full 36 week program can be found by clicking here.